← Using the LifeCam Cinema with Windows Live. WordPress.com launches the Theme Team! Wow! things are really looking up of late for WordPress.com users. WordPress.com have often been criticised by users of the free blogging site for their lack of choice where the themes on offer to users were concerned, but it now seems that they have taken note of those criticisms and have now launched a new Theme Team. There have already been one or two new themes launched recently to much praise and acclaim by those who make use of the blogging site with many requests for more themes to be launched, so perhaps those frequent pleas have prompted this latest move. Certainly when comparing WordPress.com to its counterpart at Blogger.com there has been a lack of choice for bloggers, not only in the theme department but also in available Widgets that will work with WordPress.com as well. I myself have recently changed this blog to the very latest theme to emerge from the team called Inuit Types. This one has plenty of flexibility built in, such as displaying the sidebar to the left or right, showing all posts in the main column or all posts as a normal post. 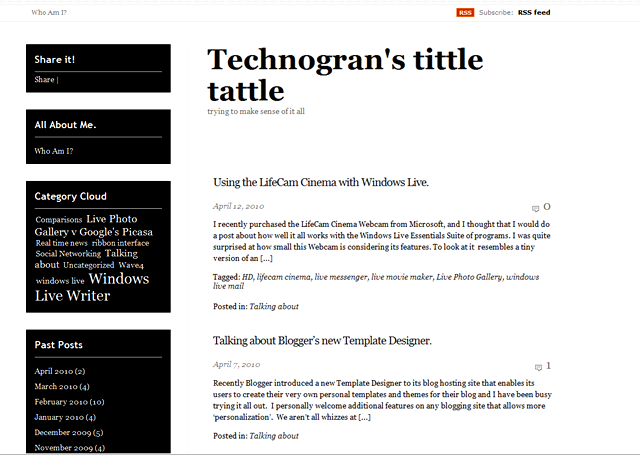 The user can also choose the colour scheme for the sidebar widgets as well, or choose to have a white background theme (the default) or a black theme. Lot’s more themes are promised in the future by the Theme team and for once it’s really nice to see that users views are being listened to and acted upon. I am hoping for some flexible width themes as I like the writing area to be at least 700 pixels wide, I am not keen on narrow themes myself, mainly I suppose because I love to incorporate pictures into the writing area to ‘break it up’ I am showing you this theme in both black and white with the sidebar at either side so that you can see how versatile this theme actually is. So well done the WordPress.com team, keep it up! TG Which do you like best for my blog, the black version or the white version? A granny and a geek? You bet! Still trying desperately to keep up with it all. 7 Responses to WordPress.com launches the Theme Team! This is exciting news for WordPress bloggers. Glad to be of service to WordPress.com users! If WordPress want to compete with the likes of Blogger et al, they have to create more themes so that we users can feel that our blog is individual and different to everyone elses. Thanks for the comment Penny! Nice to see you over here. Have you a blog on WordPress? 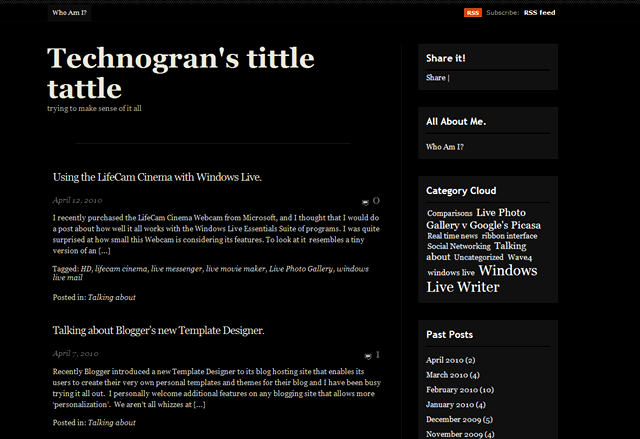 Your present state of blog settings looks nice and good.